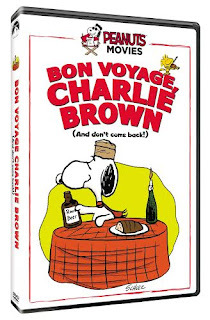 I was excited when I first heard this movie was coming to DVD, as it was always one of my favorite Peanuts films and one I had hoped to be add to add to my growing Peanuts/Charlie Brown DVD collection. It was hard to see who was more excited when our review copy arrived a few weeks ago...but, I think it was me. I made an exception to the rule of waiting to Friday's to watch movies, as I really wanted to see it and see if it was as I remembered it as a child. As the movie began playing, I felt myself reliving my childhood and was happy to find that I remembered this film. My girls had a blast watching it, as it contained the whole Peanuts gang. Do you remember seeing this in theaters as a child? Was it one of your favorite Peanuts movies, too? I found this to be enjoyable because it was different from the others, as it takes the kids to France as part of a 2-week foreign exchange program. The movie itself is 75 minute in length, and will have you smiling from start to finish. Come on, you can't help but feel happy watching a Peanuts movie. And, I was so excited to be able to share a childhood favorite Peanuts movie with my girls, and hear they love it, too! "Grab your passport and pack your bags because the Peanuts gang is going on their first international jaunt in BON VOYAGE, CHARLIE BROWN (AND DON’T COME BACK!! ), arriving on DVD for the first time ever October 6, 2015 from Paramount Home Media Distribution. Released theatrically in 1980, and celebrating its 35th anniversary this year, this charming movie was the fourth feature-length film made with Charles Schulz’s beloved Peanuts characters and was a product of the long-time collaboration between Schulz, animation director Bill Melendez and producer Lee Mendelson. Together, these three helped create all of the Peanuts animated television specials and feature films, starting with A Charlie Brown Christmasin 1969. In BON VOYAGE, CHARLIE BROWN (AND DON’T COME BACK!!) Charlie Brown, Linus, Peppermint Patty and Marcie are chosen as – you guessed it! – exchange students, destined to spend two weeks in France. Of course, Snoopy and Woodstock join the French odyssey, which turns out to be a combination of mystery, intrigue, and romance coupled with the usual misadventures that seem to follow Charlie Brown wherever he goes!" Thanks to the kind folks at Paramount Home Media Distribution, one (1) lucky reader will have a chance to win a copy of this first ever on DVD release. To enter, please complete the entries on the Rafflecopter form below. Good luck!